The city of Berlin and the surrounding suburbs have been organized into three tariff zones A, B and C. You can buy tickets for the combined zones AB, BC or ABC, as needed. Adults pay regular fare; The reduced fare is valid for children aged 6 to 14. Children under 6 do not need tickets. up to the city boundary; Airport Berlin Tegel TXL is located in this zone. Enjoy unlimited travel for 48 hours, 72 hours, 4 days 5 days or 6 days with all public transport services in the entire City of Berlin (fare zone Berlin AB) or alternatively in Berlin and Greater Berlin Area (fare zone ABC, incl. city of Potsdam) and at least 15% discount for 10 of Berlins TOP tourist attractions. The period of validity of CityTourCards for 48 hours and 72 hours commences with validation rsp. at time/date printed on the ticket (for Print tickets). The period of validity of Berlin WelcomeCards for 4, 5 or 6 days commences with validation on the first day and ends on the fourth, fifth or sixth day at midnight. 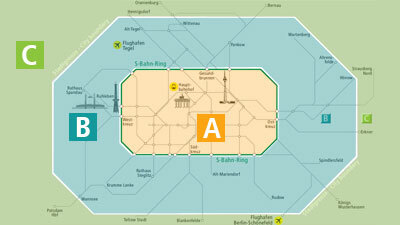 The CityTourCard Berlin AB is valid in the Berlin city area (fare zone Berlin AB). It is not possible to purchase an extension ticket for zone C.
The CityTourCard Berlin ABC is valid in the Berlin city area and in the greater Berlin region including airport Berlin-Schönefeld and city of Potsdam (fare zone Berlin ABC). With the CityTourCard up to three children aged 6 to 14 years can travel together with one adult. You can print CityTourCards for fare zone Berlin AB comfortably at home. Print tickets are valid during the selected period of validity printed on the ticket. It is possible to buy the Print ticket for yourself or for another person. The corresponding flyer for partner discounts is available on presenting your Print ticket on public transport ticket counters of BVG, S-Bahn and DB Regio AG, in Berlin Tourist Infos and many hotels. Please note: Print tickets are only valid for the person named on the ticket and together with an official photo identity card (ID Card, drivers license or passport). After starting the journey, the CityTourCards are not transferable. With the CityTourCard up to three children from the age of six up to 14 years can travel together with one adult. Children under 6 years of age (on ferries only up to three children), prams, luggage and one dog travel free of charge with a ticket holder. A reduced fare ticket is required for each additional dog. If you want to take a bicycle with you, you need additionally a bicycle ticket.